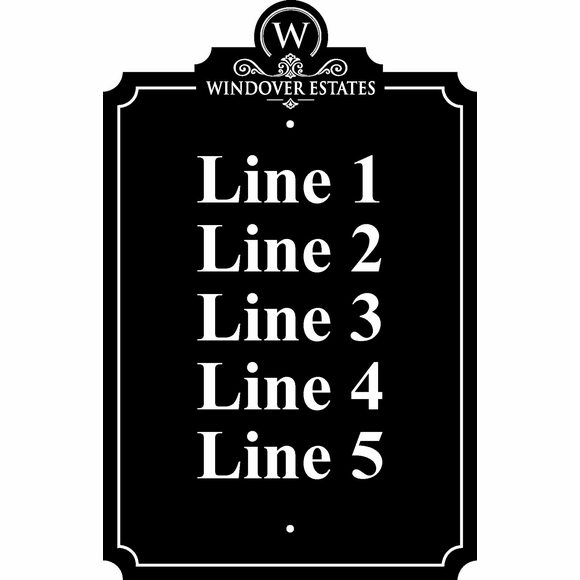 Home > Address Plaques > Address Signs > Large Custom Sign with 5 Lines And Monogram - For Multi Unit Address Numbers, Room Numbers, Building Numbers, Text, etc. Custom Sign 5 Line 18x28 Monogram Wall Sign - - says whatever needs saying on this plaque with a decorative monogram at the top. Personalized with the initial you desire, any five lines of wording you supply, and an optional business name or community name. Often used as an address sign for multi units with up to five sets of numbers, building numbers, room numbers, private property, no cell phones, smile you're on camera, wayfinding, etc. Made in USA. Decorative emblem beneath the monogram is standard. Lines 1, 2, 3, 4, and 5 hold up to ten (10) 2.25" characters each and start with a capital letter as shown. Optional business or community name line holds up to 20 characters (all capital letters). Times New Roman Bold font. Interior border accentuates the sign's cut corners.